Will the new schema markup Blocks for Yoast mess up your recipe posts? Open my emails so you don’t get dropped!!!! This past week I noticed a rash of spam subscribers to my newsletter. I checked my list and sure enough, I’ve been hit pretty hard with spambot subscribers since about May. I deleted about 50 of them, so if you accidentally got caught in that purge, I’m sorry. Please re-subscribe. I custom made my optin forms, so I definitely need to put a good honeypot spam filter on them. That’s a blank field that is invisible to humans, but bots see it and fill it out. That’s how we know it’s a bot!! I also see that it’s time for me to do a mass purge on the list. And I’ll be triggering that by folks who have not opened an email in the last six months. So, be super sure you open emails you get from me, including blog posts, so you don’t drop off the list!!! And, you don’t want to miss out on the specials I’ll be sending subscribers soon. We’ll get into those details in a moment. This past week I’ve been going full blast on the backlog of my own to do list. I updated a bunch of tutorials in Level 2 of the Webmaster Training courses. Those involved all the backup tutorials. If you use UpdraftPlus, you’ve noticed that they’ve completely revamped their interface. So, I’ll be updating all of the tutorials for it next. And while I’m at it, I’ll be making new restore tutorials for my Site Audit Plus clients, as most of them use UpdraftPlus. That will finish up our Quick Check series on backups to ensure we have those fully squared away. I also removed all of the tutorials for BackupBuddy, as I no longer use or recommend it. I’ve been visiting the new house for an hour or two just about every day, especially now that the painting and most of the flooring things have been addressed. I can now start taking things over that I don’t think the movers can handle well, or things like chemicals that they can’t move at all. And, I’ve been meeting with the workman and/or checking on their progress. I am so glad that I’m already mostly packed so that I’m not trying to fit that into the schedule right now too. 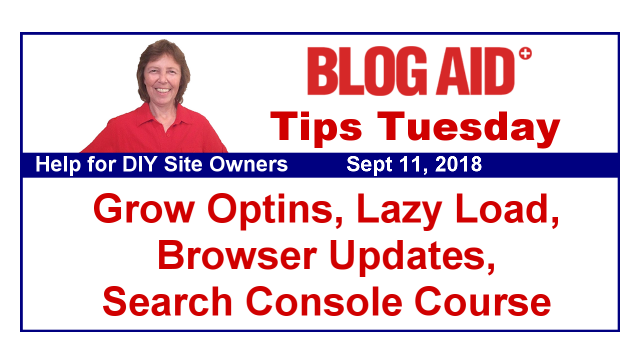 I know all of my site audit clients who are making the time to follow Tips Tuesday and participate in our Facebook group are thrilled they are so far ahead of the site maintenance curve too. When new site hoohaa pops up, they are available to jump right on it and knock it out. Being educated about their sites makes that a quick and calm check or change too. We stay out of panic mode and our sites stay in tip-top form as well. And this way we can all spend more time focused on our money makers, like writing new posts and promoting them. I have several new clients, as well as returning site audit clients who are ready for their check up on my list. They asked to defer to October. So, that’s already shaping up to be a busy month. If you’ve been thinking about an audit, even if it’s later this fall, best to go ahead and get on my schedule now!! October is the beginning of busy season for all site service workers, designers included. I usually don’t come up for air again until March. My October schedule is going to be especially packed due to making the new course on the new Google Search Console interface for the DIY SEO course. It’s especially timely, since Google just announced that the new interface will be the default when you log in now. While they haven’t brought every resource over from the original interface yet, they are cranking out new features every week. And a bunch of them are new things that we need to be tracking. I’ll be sending out an email this week to all of my site audit clients and Webmasters with a huge discount on the course. And then just prior to the new course being added, and the price of the course going up, I’ll be sending a discount link to all of my BlogAid News subscribers. So, if you’re not on that list already, be sure to subscribe, and be sure to tell all of your blogger buddies too. That DIY SEO course works!!! My peeps are showing up in Featured Snippets and Position Zero at the top of page 1 in search and getting a 4,000% increase in traffic. It also helps diversify their traffic streams so they are not counting on one other platform like Pinterest or Facebook for all of their traffic. Plus, their sites are far more enjoyable experiences for their visitors too!! Mark your calendar right now for Wed, Sept 12 at 8pm ET, 5pm PT. I’ll be Micheal Daniel’s special guest on the Tinkering with Tech Show and we’ll be talking about why Gutenberg is in line with the future of how we’ll be using the internet, including the virtual and augmented reality aspects of it. If you follow the link to YouTube, you can even set a reminder. We’ll only be doing a little bit of talking and then we’ll be taking live comments and questions from the audience. So, I do hope you can make it live!!! I’m voting – hope you will too. I’m not sure this ClassicPress fork is the way to go, but I think Matt Mullenweg will read the poll results. And that will make WP better no matter what version you use. My two important issues are PHP 7.0 as minimum version and to remove XML-RPC. Both of these are super security concerns, plus the PHP thing is going to be a plugin nightmare if devs keep dragging their feet on it. Scott Bowler, the founder of ClassicPress reached out to me via my Facebook post on this. So, he and others are listening and trying to garner as much community support as possible. I don’t have intentions of using ClassicPress at this time. But I am keeping my eye on where this goes with the community. So far, the discussion on the vote page still looks like the same dev-only discussions we’ve always had, with little end user input. Plus the same ole “we might break something” drag on any changes suggested. It’s time for end users to step up and get involved and help steer the direction of WordPress development. So go vote!! And if you’re wondering what ClassicPress is, see my previous Tips Tuesday posts. Tasty Recipe released an updated version that has several features that Marilyn helped up-vote, and schema markup that was missing, which I pointed out in my recent tests. We’ve both updated our posts for these new features. And we found a big deal with this plugin on abbreviating prep and cook times. It will throw a schema markup error over that. So if you use this plugin, be sure to spell out the words hours and minutes. Marilyn tells me all the other plugins like those words abbreviated. If you want to check your schema markup for errors, there’s a link to Google’s Structured Data Testing Tool in the post, with tips on what to look for. As y’all know, I’ve been recommending the free LazyLoad plugin made by WP Rocket as a supplement to those running the free version of WP Fastest Cache. But, it doesn’t have many settings options. So, I checked out the BJ Lazy Load plugin and it has lots of settings options, including one to just apply lazy load to Gravatars. If you run ads on your site, but have lots of comments, this will help with overall page load time. I was pretty thrilled to see WP Fastest Cache add a lazy load feature to their premium version! That’s one of the suggestions I made to the dev during my speed tests. It’s very much like the one in WP Rocket, which only has settings for images and iFrames. I’m looking forward to testing it to see if you can turn it off on a per page/post basis, like you can with WP Rocket. That setting was critically important for me, as you may recall last week that I reported a conflict with lazy load and Google’s reCaptcha on my contact form. Team Yoast has been jumping all over improving the plugin to be Gutenberg compliant. Their latest efforts are focused directly on the Blocks, which are at the heart of the new editor. You will be able to add special formatting and markup to each Block. Yoast is working on a way for you to include special schema markup for each Block. I see a couple of caveats with this. First, I hope this doesn’t conflict with recipe plugins, which carry their own schema markup. I think the recipe plugin devs are planning on making their own custom Blocks. So, we’ll see if those fight with each other. Second, schema markup is a hierarchy, meaning it has a top-down structure. To get the most benefit from using it, your theme has to also support it, to give it the tip top hierarchy. So, folks using the Genesis framework are getting that support, and their recipe plugins are doing better with Google than folks who are using other themes. That’s also true of using any other type of schema markup for local business listings, video SEO, and more. All of this is just one more reason I advise holding off on the switch to Gutenberg. Everything about it, including plugin compatibility, is still being worked out. None of what Yoast, and other plugin devs are creating is going to drop support for non-Gutenberg sites. So, we’ll be good right where we are, and we’re not missing anything cool by not jumping on that ship right now. For my Webmasters who work with small biz site owners, Google has given a thumbs up to placing reviews from Yelp and Google Maps on your site now. This is a big bonus so visitors can check out your business without having to leave your site. That’s going to help with conversion like crazy. Mozilla, the makers of the FireFox browser, just announced that the latest version will block all cross-site third-party trackers. Wonder what this is going to do to our analytics, especially those from ad agencies? Those ad agencies use their own pixel tracking, as does Facebook Pixel Tracking. This info is at the heart of our marketing and money making. If you run ads from an agency like MediaVine or AdThrive on your site, or even if you use Amazon or AdSense, I sure would like to know if you have received any word from them about this. I’m hoping they include ad-block busters to deal with this. Chrome is rolling out version 69 and one of the big changes is that they have dropped the www from all URLs. Now, that doesn’t mean there is no www, it just means that it is not being displayed. They are no longer displaying m. for mobile versions of a site, if anyone still has such a thing. There are instructions in the article for how to display the full URL, but I seriously doubt most folks will do that. Heck, I doubt most site surfers really care one way or the other. Most folks stopped typing in www a long time ago, especially on mobile. Should you drop www from your domain? Check out my post on www vs non www for which is the best to use and why. This is something I usually change for folks during an HTTPS conversion. And I would strongly caution you not to just change it in your WP Settings. That doesn’t convert the links in your database and you’ll have a mishmash of links. As you’ll see further down in the article, this whole dropping of the www and m. sub-domains thing has caused a huge issue. They give the example of m.tumblr.com being an entirely different site than tumblr.com. Another big change is that Chrome is also no longer displaying the secure status for HTTPS sites. It is only displaying a Not Secure warning on non HTTPS sites. That means the little padlock thing is no longer there. I don’t have a non HTTPS site link to test that on. If you do have one, let me know. Best to reply on my Facebook post for Tips Tuesday for that, as my comment spam filter will probably block a link, or at least hold if for moderation. There are other changes in Chrome 69 that you’ll want to check the article for, especially for Windows users. So, go have a read. Growing your email list is the best way to build tribe and ensure you get more return visitors to your site. Hopefully you all have an optin somewhere on your site. If that’s only in your sidebar, perhaps folks aren’t seeing it, especially on mobile. Your sidebar ends up at the bottom of your post, past your comments and such. Have you considered adding a pop up? You know Google and visitors don’t like one appearing too quickly, or ones that block all of the content. During site audits, I notice that several of my clients have taken to using an exit pop up. It appears the moment your mouse leaves the main window, like when you go to the top of your browser to either exit or use the Back button or such. I think that’s a great idea!! If you do this, what plugin do use? Or, if you have a pop up elsewhere, when does it display and where? Also, do you have a dedicated page for your optin, like I do for BlogAid News? You can’t link to a sidebar or pop up. Having a dedicated page allows you to promote a direct link and get more subscribers. The BJ Lazy Load plugin was a great find, MaAnna! Lots of options. One of my sites is unsecure, and that warning is in gray next to the url. People are going to miss the green padlock though. In gray? What the hey? I really think getting rid of the padlock is a big mistake. I always look for that on any site where I am sharing personal info now. Full of important information as always! Thank you MaAnna! I’m delighted you get so much good from the weekly posts, Tipper! !